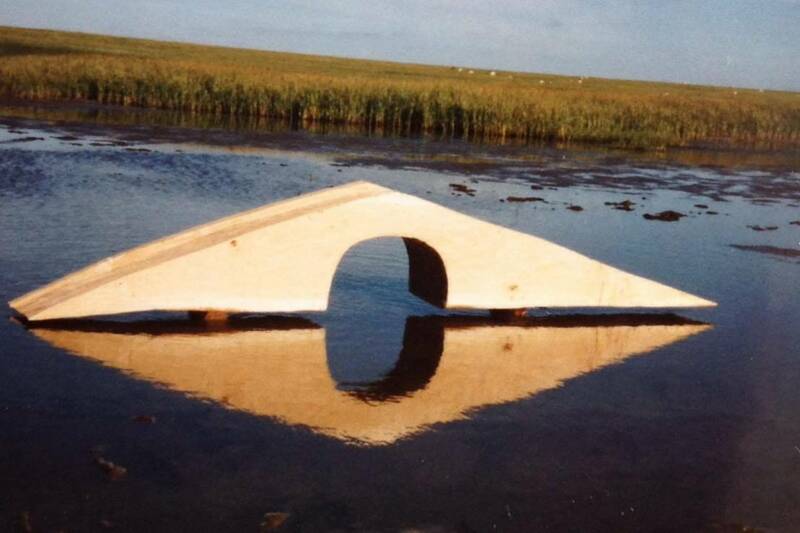 Below you will find the history of "Højer Internationale Træskulptur Symposium". 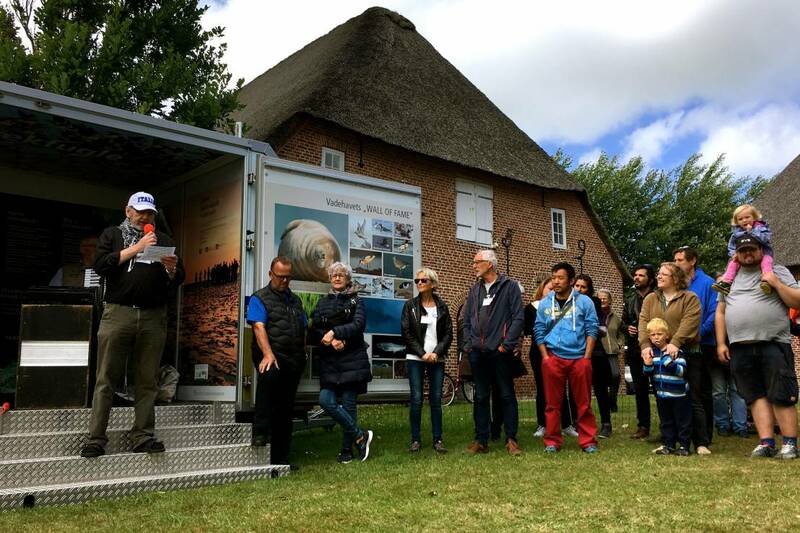 We also welcome you to read some of the stories sent to us by people involved in the symposiums in Højer. The stories are all written to us in connection with the publication of our book about our 25th anniversary in 2017. 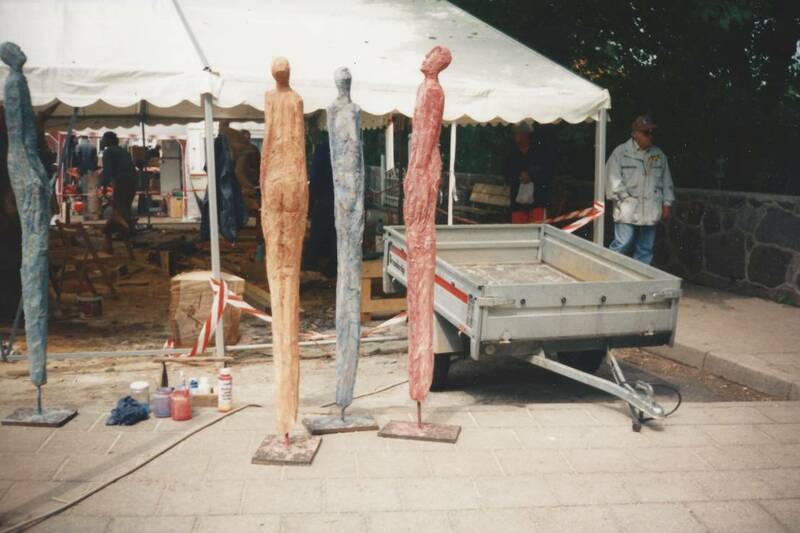 In the beginning of 1992, after hearing about an ice sculpture symposium in France, some locals started considering the possibility of hosting a symposium in Højer. Quickly understanding, that hosting an ice sculpture symposium would not be a possibility in Højer, they considered different possibilities. During the spring of 1992 the idea of organizing a wood sculpture symposium came to life and the planning started. 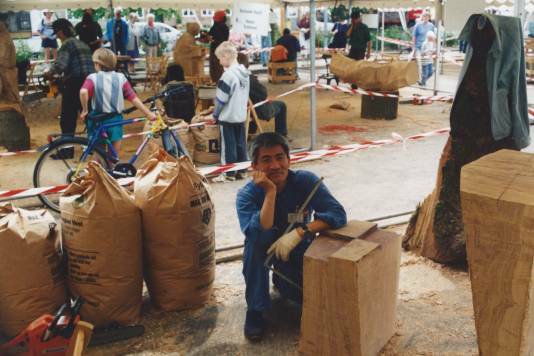 In June 1993 the very first wood sculpture symposium ever organized in Denmark took place in Højer. 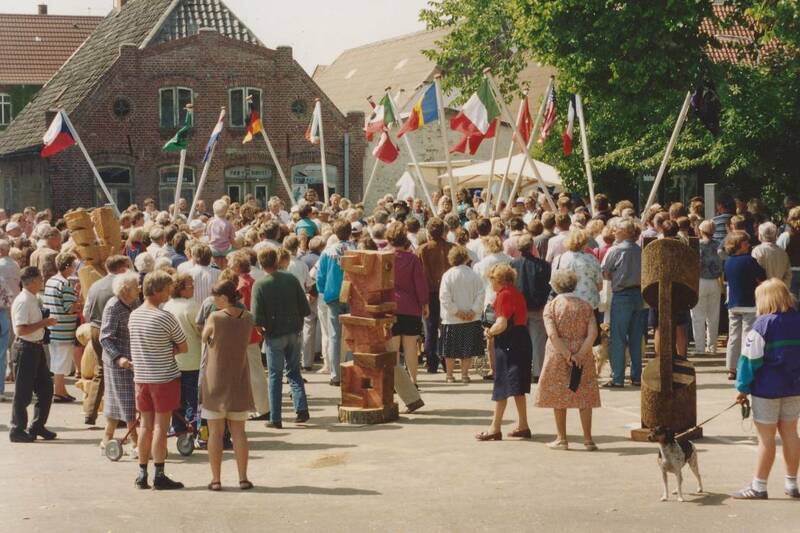 The artists participating in the symposium 1993 were privately accommodated and the symposium took place at the main square, in front of the curch in Højer. The food was sponsored by the local pub "Bykroen". Højer International Wood Sculpture Symposium which this year was held for the 3rd time and which attracted more than 20.000 visitors each year for the last two years, and hereby has been making Højer world-known, is from 29th of July 1995 transformed into an independent trader Cultural Foundation, established in Højer. The foundation Board consists of chairman and restaurant owner Albert Pedersen, Højer, vice chairman mayor Knud Hansen, Højer and cashier sign painter Ole W. Andersen, Højer. 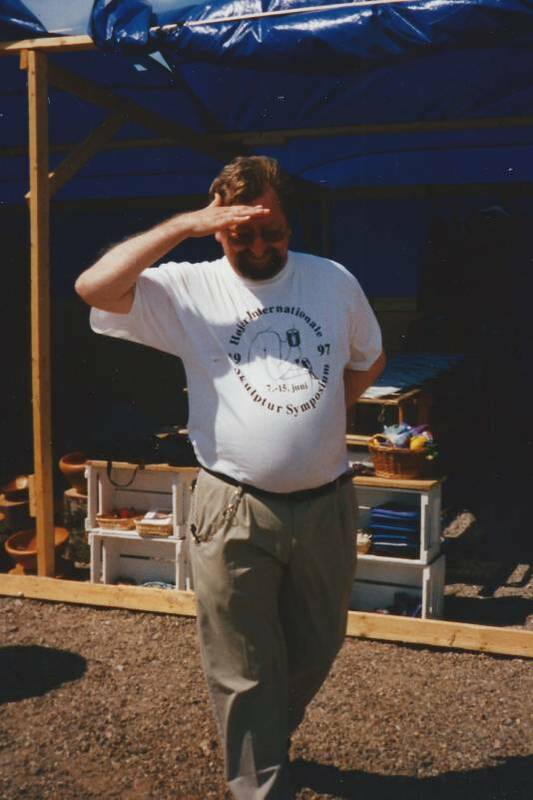 10th of August 1995 the first meeting was held where the first work groups were established to take care of the following functions: Location group with Dieter Bjørn as chairman. PR and sponsor group with Svend Kræfting as chairman. 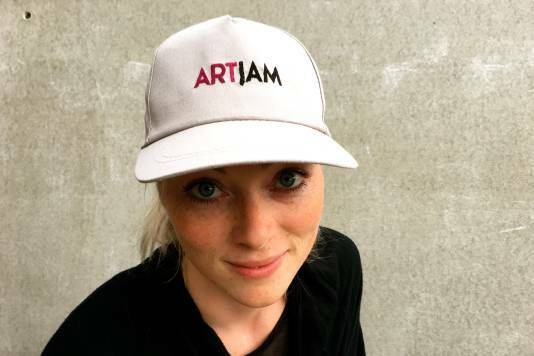 Art group with Hanne Sönnichsen as chairman. In June 1998, I turned 10 years old. My family and I were in Højer, Denmark at that time. 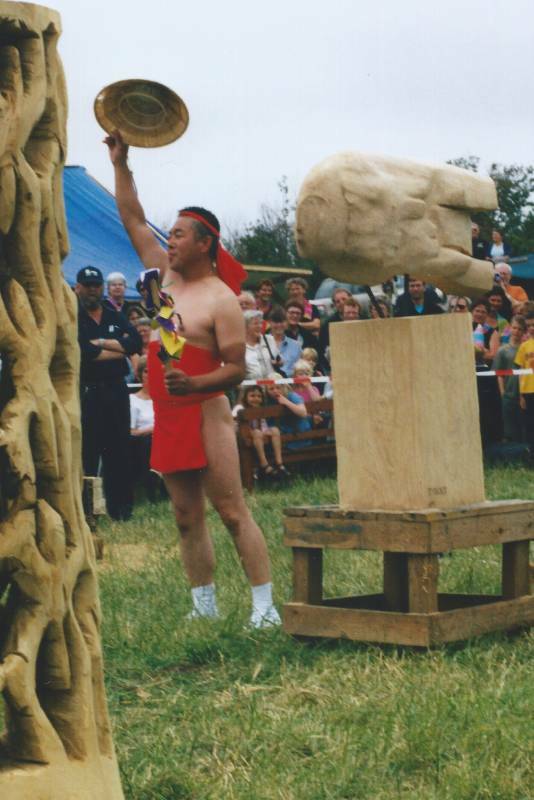 My father, Michio Oki is a sculptor and an art performer. It was the very first abroad experience for my mom, Sachiko and me, Akari. My father joined the symposium, in Højer, 3 times. I will write just a few memories out of tons from the first year. In the beginning of June we were welcomed by Ole Andersen at the airport. He was really friendly and funny. We loved how he pronounced “ketchup”. I met Sannie, Steffie and Tommy (children of the chairman for the symposium), their parents (chairman and wife) and their big dog. I immediately became friends with Sannie and Steffie. I only knew a few easy English words, but we could communicate somehow. Sannie and I were the same age. Sannie and Steffie had short hair. They were very cute. My mom and I were thinking Steffie must be a boy until the first night I slept over at their house. The lack of communication resulted in Steffie’s mom telling her to show us she was not a boy, by taking of her underwear. I was surprised that kids could play outside even at 11 P.M. just because the sky was bright and it looked like it was still noon. We loved to jump on the big colorful trampoline every day. Sannie and Steffie took me to their school. I was really nervous but it was a cool experience. My family stayed at the campsite in front of the sea. On my birthday, when I got to the hotel where the symposium was held, artists and everyone welcomed me with singing the birthday song with a huge birthday cake. I was really happy and heart warmed. Every artist from around the world and people we met were so kind to us and really open minded. I was really inspired by their differences. Still now when I hear those countries names I feel somehow related with them. We were so happy that a Danish family bought my father’s sculpture and kept it. In the farewell evening the artists sang their own favorites songs and my mom sang in Japanese too. 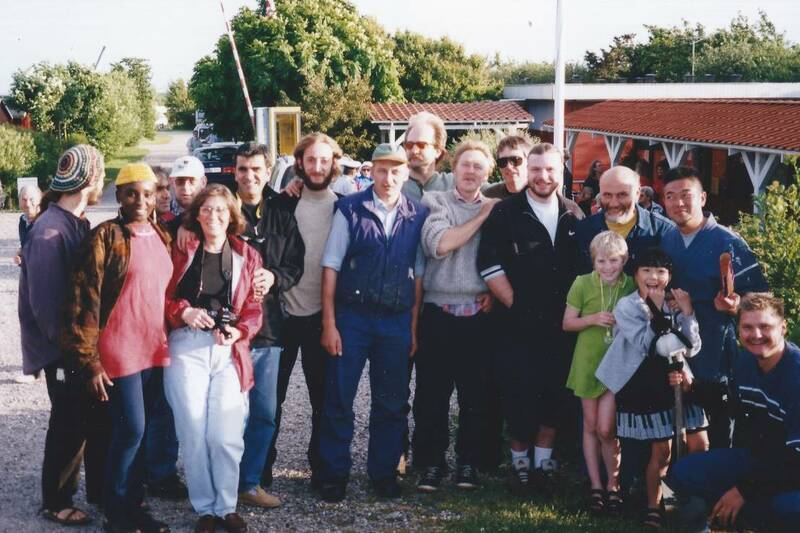 Even though it has been almost 20 years since then we will never forget the special feeling we had with everyone we met in Højer. When I smell wood, hear the noise of chainsaw and feel the comfortable breeze I cannot help but remember Højer and imagine how everyone is doing somewhere in this world. We appreciate all people who supported us there. Thank you very much. At last congratulations on the 25th anniversary! The experiences I had in Højer made me think we can be friends wherever we are from! My father is still a hard working artist. I’m on my way to be an international actress. With tons of love from Japan. By Akari Oki, Japan, 2017. Through the history of the symposium we have experienced, at least 2 times, that artists at the symposium fell in love and later got married. The first time was in 2002, when Susanne Ahrenkiel Nielsen from Switzerland/Denmark and Søren Brynjolf from Denmark met each other. We quickly noticed there was love in the air, because they always arrived late for dinner. Already the first day I saw a beautiful female artist with a flag from Switzerland on the table. Her name appeared to be Susanne and she appeared to be pure Danish. 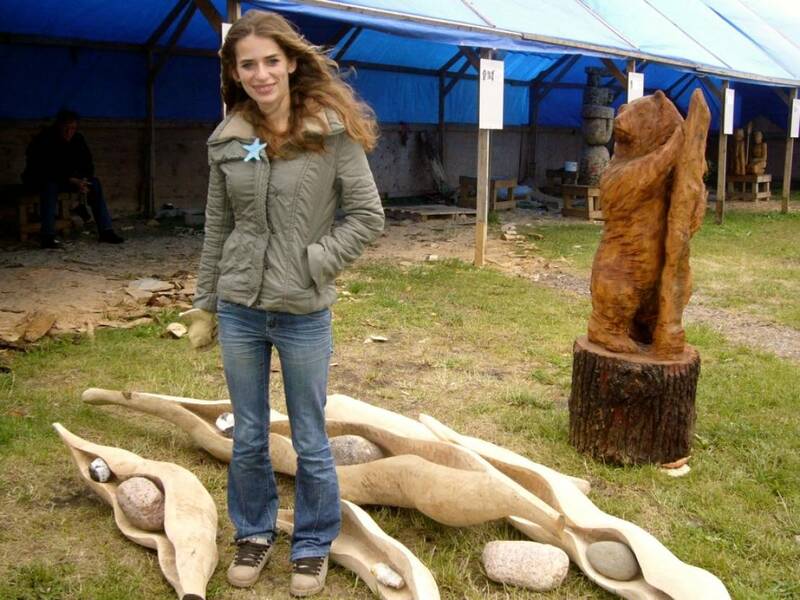 I like to say I won her over by giving her a carver sword which is the sword of the chainsaw intended for sculpture work. It became a stormy crush that resulted in a marriage, a working cooperation and 12 years where we “moved mountains” together. Already at the symposium we discovered that we had a common passion for the circus carriage and in the same year we built a beautiful circus carriage that has brought us so many special and fun experiences. One of them was a long tour through Jutland in the ”sculpture carriage” which led us to the symposium in Højer once again. By Søren Brynjolf, Denmark, 2017. My story begins back in 2008, when I, a young student of the Russian Architecture University, began the search of my creative path. By participating in European sculpture symposiums I was trying myself in the field of visual arts. In 2008, I was participating in 2 symposiums in Italy and 1 in Germany. My first time faced with the issues of getting and using a visa in the European territory. Returning from my 3rd sculpture symposium in Germany, I had stayed 2 days longer than it was possible on my visa. For me, as a Russian, rules are made to be broken, so 2 days overstay is in general absolutely normal. In addition, I was feeling like a super important artist, with an invitation to a symposium signed by the mayor himself! I remember how I tried to prolong the visa during my stay in Germany several times, but without succeeding. I was sure during my departure through passport control, they would forgive me for everything and even thank me for creating art for the German people. However, everything turned out to be accurately opposite, instead of the picture of thankful words that I had in my mind, the German border guard yelled at me, regardless of official papers and my sweet stories. The first time I encountered the fact that the rules are not breakable or changeable. Once at home, I immediately forgot this story. 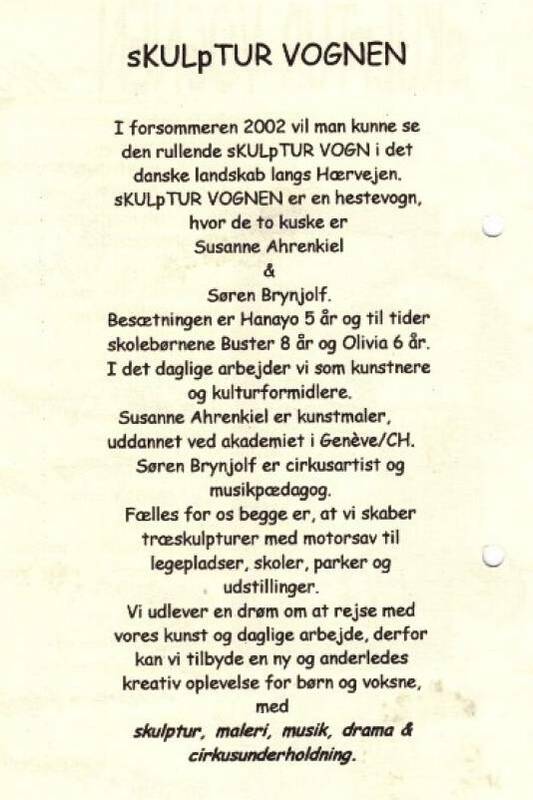 In the beginning of the winter of 2008-2009, in my mailbox, I received the conditions of a wood sculpture symposium in Højer, which I had already heard about from my father's student, Julia Mayulova, who by that time participated several times in Højer symposium. Julia told me about the city of Hojer, about the auction of sculptures and about the main organizer, Albert, and on the basis of these stories, I imagined how the city and people would look like. 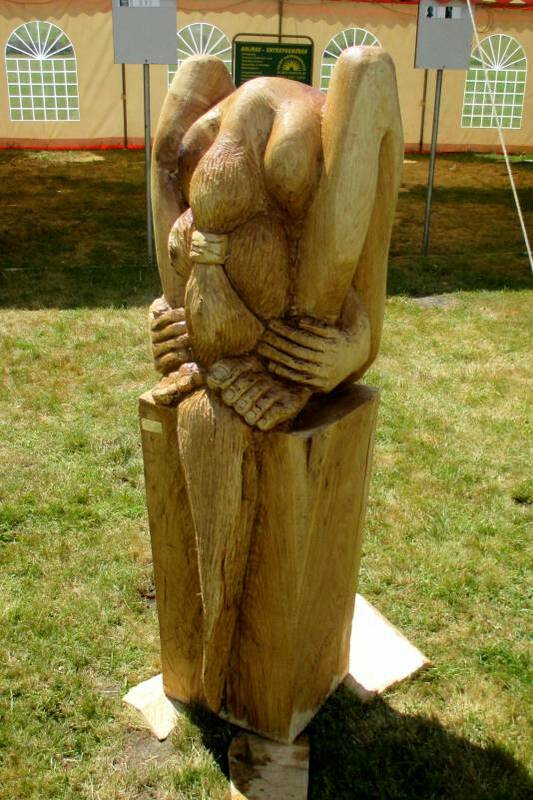 In the symposium conditions it was indicated that from one trunk of a tree it was necessary to make 2 sculptures. After consulting with my dad, Yuri Tkachenko, I decided that it was possible to cut the trunk diagonally, thus obtaining two pieces and making Adam and Eve sitting on their knees, and between them an apple. I drew a plan for how to cut trunk, a sketch with naked figures and an apple, and prepared the necessary documents. All this was sent to the address of the symposium. It was 2009 and one day I received a letter from Albert with an invitation to participate. The naked Adam and Eve did their thing, or maybe it was because of the apple ?! In any case, I was very happy. As usual, fixing everything in the last moment, just before I had to go I started to apply for a visa. And as you probably already guessed, in the visa office they refused to give me the visa, due to my previous history, and I did not have time for another attempt either. In Højer they already printed catalogs with photos of the participants and their sketches. The wood was installed at the working place, the hotel room was paid for and so on. For me, perhaps, the hardest thing was to muster the courage and write a letter stating that I will not come, literally, a few days before the start of the symposium. However, I had to do it. The years passed, and over and over again I sent my proposals to the subsequent symposiums, without losing the hope, I believed and waited. I was sure, they would choose me at some time, no matter what. 6 is a good number, six times I sent my application, which means 6 years passed. Surprisingly, circumstances developed, and my proposal "sheep" was chosen. From the "blacklist", I turned out to be on the list of participants. Today I know the funny detail about how I was chosen, but I will not tell you. Instead I'll tell you what happened next. 13th of june 2015 at Kolding train station I met David along with another participant of the symposium. The road to Højer took more than an hour, a great opportunity to find out how things are in the city. According to the driver, Højer was a small town, without pubs, bars and nightclubs, there was only one beautiful girl, she was the daughter of the organizer and she was 23 years old. - "Hmm, and I'm 27", I answered with a smile. The same evening I saw Steffie at the dinner, and how they write it in novels: "I have not seen anything like this in my life" or "as if lightning struck me" or "the spark lit" or "this moment can never be forgotten" or "the arrow pierced the heart" or "looking at the most beautiful person in the world" or "at that moment my soul sang" all this and other metaphors described by the great writers were an absolute reality. It is good that at that moment I was sitting, otherwise, from the overflow of emotions I would have definitely fallen. After some time, slowly coming to myself, I decided to act - to start a dialogue. 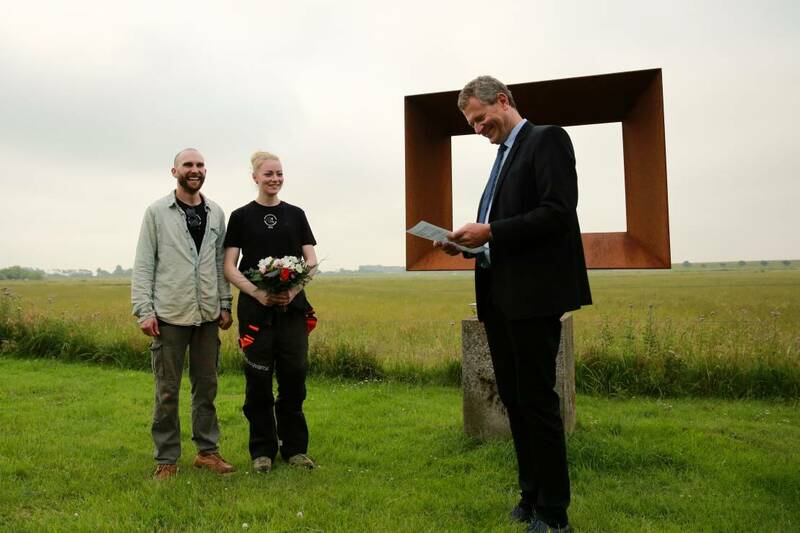 Waiting for the right moment, I began to ask Steffie about the opportunity to wash clothes and such other practical questions and suddenly she said "I chose you"... Our wedding took place during the next symposium in Højer on June 24th 2016, we were in our working clothes, covered with wooden dust, we turned off chainsaws in order to kiss in public and exchange rings, perhaps it was the most unusual wedding that I ever attended. Today we are a young family, we have two beautiful daughters, and the very same sculpture "sheep" is the favorite toy of our oldest daughter, Runa. And I assure you friends - there is happiness in this world, I can assure you, because I am happy myself, as is my whole family. Looking at this amazing story in retrospect of time, we sometimes speculate: what if we had met in 2009? What would the reaction be to each other? How would our destiny unfold? Is there a destiny? Was this a foregone conclusion? Anyway, I'm infinitely happy that everything happened as and when it happened. Thank you! 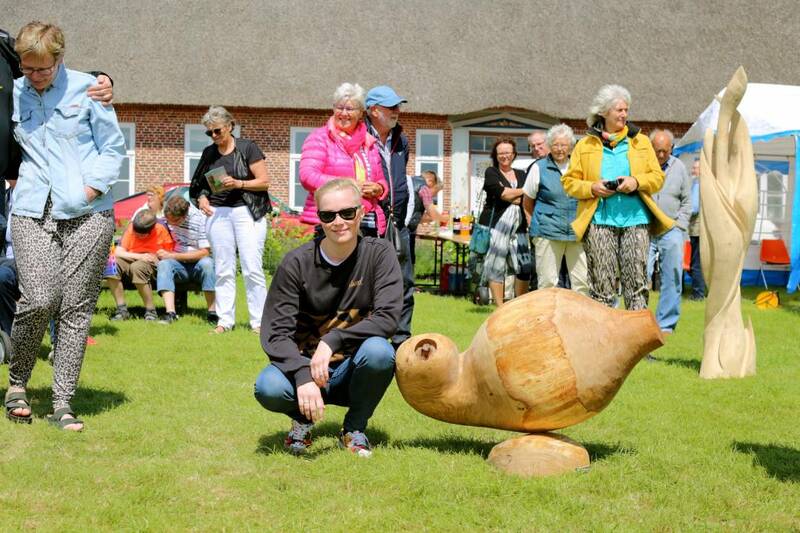 To me, Højer International Wood Sculpture Symposium has meant a lot. I was 1 year old when the first symposium took place in Højer, so one can assume this is where my interest in wood crafts and cultural differences began. 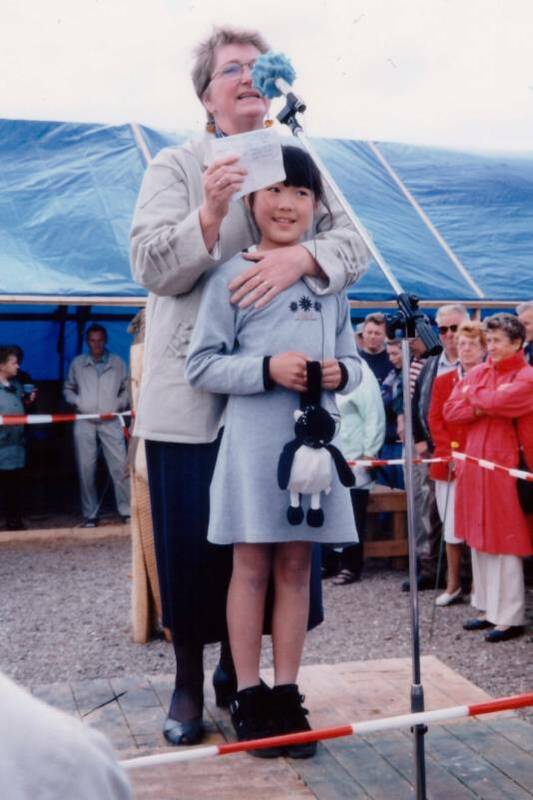 Since I was small, I have been very interested in the whole event and, as the chairman’s daughter, I was allowed at an early age to attend the selection process when artists for the next symposium were chosen. I have been lucky to be able to experience the whole process, from the planning to the implementation, all 25 years, even though I do not remember the first years. First as an adult, I understand how much the symposium has influenced me. I have linked friendships all over the world and have been challenged in the artistic world ever since I was small. Looking back at the many years of fun, exciting and interesting experiences, one of my clearest memories is how the many artists made me desire to create. Through the symposium, I got the desire to try making sculptures myself, which today has resulted in me having participated in several symposiums, among others Højer, last year. I have learned a lot through the many years with different artists and I have met many interesting personalities. The most important person I met through the symposium in Højer must be my husband, Gleb, whom I was a part of selecting, for coming to the symposium. 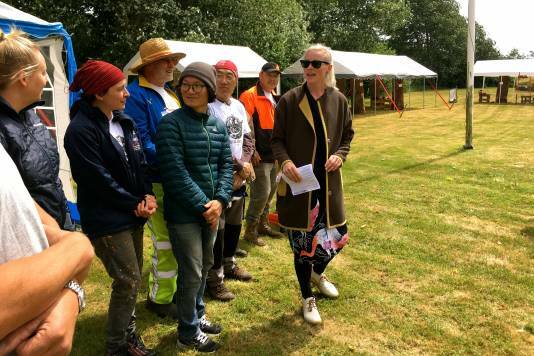 Today I am vice chairman of the association for Højer International Wood Sculpture Symposium and am a part of continuing this amazing and exciting event that I grew up with and which is an event I definitely believe we can be proud of having been able to implement for so many years in a row. It is a huge accomplishment that you do not see many places in the world. Congratulations to everyone who has been a part of making this a reality for all these years! From Højer to Tokyo - via the symposium. 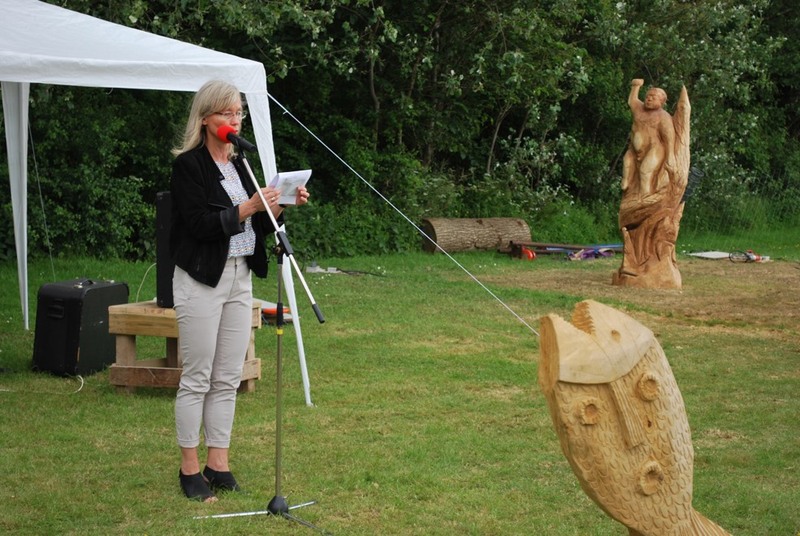 Højer International Wood Sculpture Symposium attracts participants from all over the world each year. These foreign cultures and their traditions bring some excitement to the everyday life in Højer - not just for the public in general, but also for the artists and craftsmen living in Højer. Guest artists give inspiration and insight into the unknown - and conversely, I am sure that the stay here in the marsh means something for the future work of those who participate in the Symposium. For several years, I had the pleasure of working in the Symposium Board and a constant feature was that the foreign artists visited my own home and workshop. These many foreign guests have contributed to my work on several occasions, and I have gifts and other greetings from a lot of countries around the house. In 2001 an invitation from Japan came. Oki, who participated in the symposium for several years, now invited deceased Jan Leseberg and me to exhibit at a major international exhibition in Tokyo. We left and got two weeks of intense experiences in the country of the rising sun. The big exhibition was the main purpose of the trip, but what I remember the most was the meeting with such a different culture. For example, we had a hard time finding our way, as most road signs - also in Tokyo - were with Japanese characters, there are countless rules for what you do and especially what you do not do - which may give a tourist something to think about. There were new and different impressions everywhere. I was particularly excited about the daily meeting with traditional kimonos in the modern street scene. Very few places in the world textiles are as highly respected as in Japan. It made a great impression to visit the temples - giant trees have delivered the most beautiful planks I have ever seen and the red Shinto gates still show up in my memory. The beautiful Zen gardens sometimes gave us the peace we sought when the impressions became too many. For me, meeting with other cultures - and preferably of course, travelling on a trip - is a necessity, it’s simply the best fuel for my work. That I was allowed to visit the country that has meant the most for my own art-language was of course a great gift. 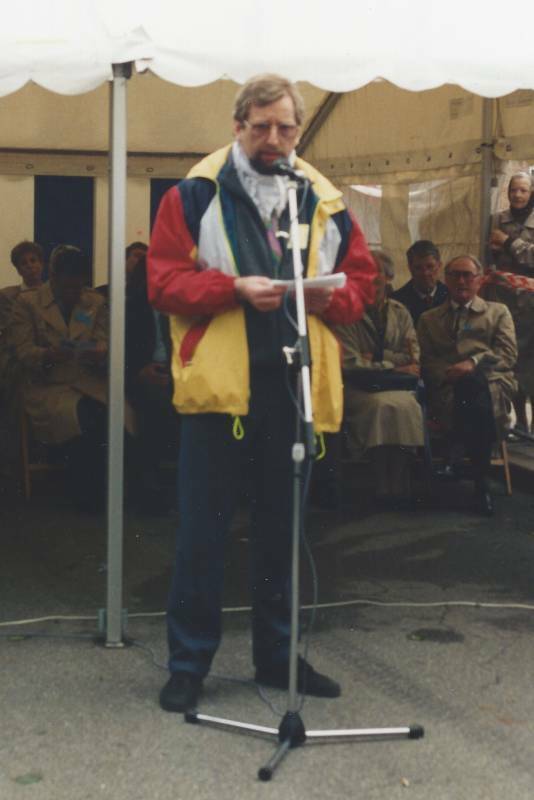 2002 was, at least so far, the last year Mitsio Oki was participating at the symposium. Oki was a very nice feature of the symposium, and both during the symposium and at the closing ceremony he entertained with Japanese singing and dancing as a tribute to the symposium. In occasion of the symposium’s 10-year anniversary we started a painting symposium. We invited 3 Danish and 3 German painters. By Hanne Sønnichsen, Denmark, 2017. Whenever I hear about Højer I always react with a smile. This place brings me special memories because Højer symposium was the first of one hundred for me. When I was 20 years old and a first year student, I saw the application form of the symposium by chance and I decided to try and to send in my documents. Of course, I had no idea what a sculpture symposium was and the possibilities that it gives you for work, learning and joy. My very big surprise was when I received a letter with the invitation. I was very excited and at that time I did not know that I would have a life as a symposium artist. The event showed me the endless possibilities of working with other materials - I saw the pictures and heard the stories of the other artists, who had more experience and I learned a lot. Since then I have tried to sculpt one by one stone, sand, snow, ice and other materials and now I can enjoy and experiment with all of them. In Højer I made not only friends but also I felt like a part of a family. I was welcomed in the life of Albert and Pia and their children. I saw the love and dedication that they work with, and even if the sculptors are crazy and always complaining, the organization never fails. Some years later I participated in the symposium again. It was a strange feeling of being back home after long time away - warm and happy feeling to see the same people, same place and good memories. My dear Danish family - congratulations on the 25th anniversary. Thank you for showing me the way, I often think that without this good start my life would have been different. I wish you strength to continue with the symposium for many more years - one of the very few symposiums in the world with that long history. And for the visitors - please bring a warm jacket - Højer is beautiful but can be really chilly in the summer. By Lilia Pobornikova, Bulgaria, 2017. In 2013, Pia from the symposium in Højer called me. She asked if I would like to have an African man staying at my place for approximately one week after the symposium in Højer finished. Perhaps a perfectly normal question for some, but I felt, however, that I had to ask my girlfriend, Dorthe, what she thought about it. 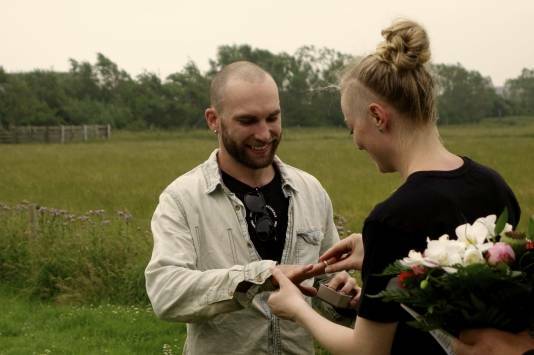 Dorthe said “yes” and this was the beginning of a long friendship across borders. Pia had said that if we would let him stay at our place and show him a bit of the area, he would perhaps make ”a small sculpture” for us. We found some oak trunks so he could choose a piece that suited him. Mutumba came and we took a look at the oak trunks, he quickly chose the biggest of them all, which he would like to have a piece of. In the evening we went on a trip to Ribe and visited ”Biler på Hovedengen” (Cars on the meadow), a place where you can look at Veteran- and old American cars every Tuesday during the summer. Mutumba showed a great interest in the buildings of Ribe, as well as for the old cars. While he took many photos he told us that he built houses in Uganda. It was July and unbearably hot already from the morning. It was no later than 07.30 the next morning when I heard a chainsaw buzzing behind my property. It was Mutumba who had started working. He had cut more than two meters of the trunk. I had expected that he would make something small, that could be placed on a table in the livingroom, and that he would relax for a while, as it was just after the symposium in Højer. Mutumba had made a working sketch the evening before. I had told him my story, about my time in the band “Brøns Greatest” and that I am now suffering from heart disease. This is why he wanted to make a guitar man with a big heart, that would symbolize me. He did not relax much that week. We had to tell him to relax, it was almost 30 degrees in the day time, but Mutumba said: ”Very nice temperature, only a little cold”. We also needed to have time to show him the area so he could take some experiences with him. The result of that week was ”Guitar man”, 180cm high, situated in my living room as a proof of a week of experiences with Mutumba, a lasting memory. By Flemming Pedersen from Brøns, Denmark, 2017. 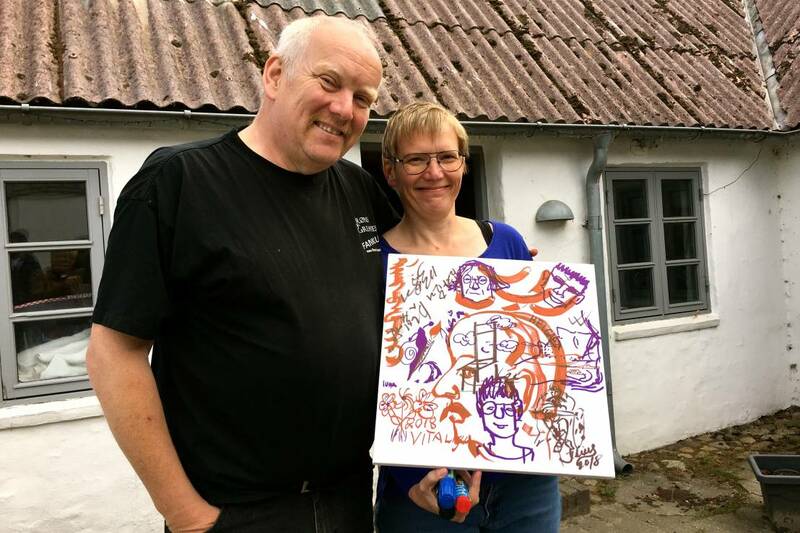 Flemming Pedersen and Dorthe received co-operative picture made by Højer Art Jam 2018 Artists. 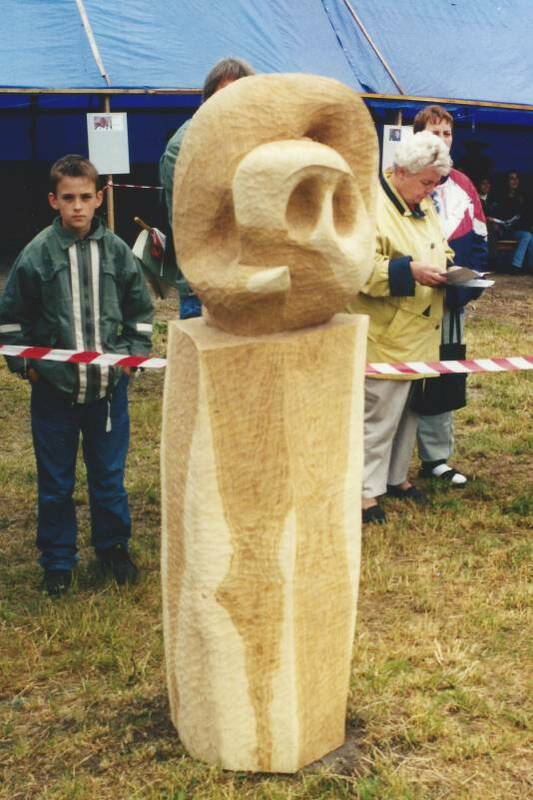 When I decided to invest in a sculpture made of wood, it was not the first time I had been acquainted with art. I am a member of a local Lions Club and have been a part of their art committee for some years. The difference is that we arranged art exhibitions with artists who are working with paintings. 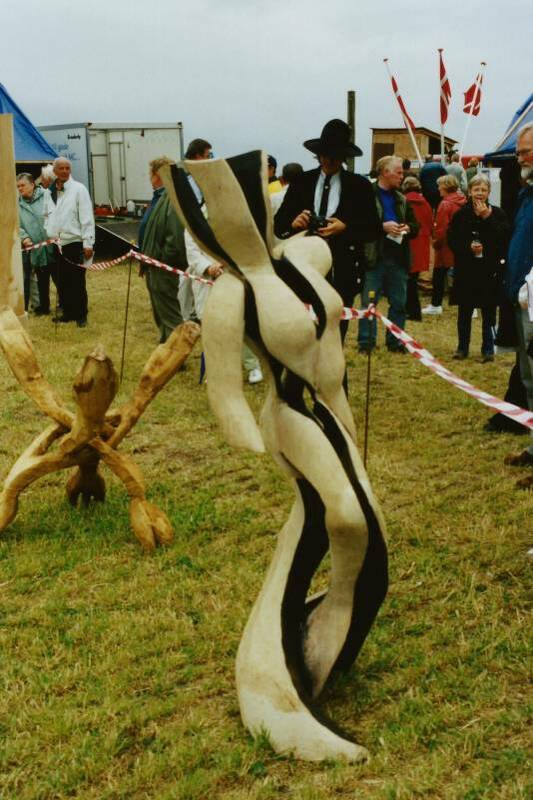 My knowledge of the Wood Sculpture Association in Højer began approximately three years ago, when I got to know Pia and Albert. Shortly after, I was introduced to the symposium work and I found it very interesting what they were doing. Of course, I wanted such a sculpture, but which motif should I choose? One day, I knew I wanted a guardsman. We have proud traditions in my family with the regiment and we fully support the Royal Family, so it was an obvious choice. After I chose the motif for my sculpture I sent photos of the guardsman statue that is placed at the barracks at Rosenborg Castle to the symposium. 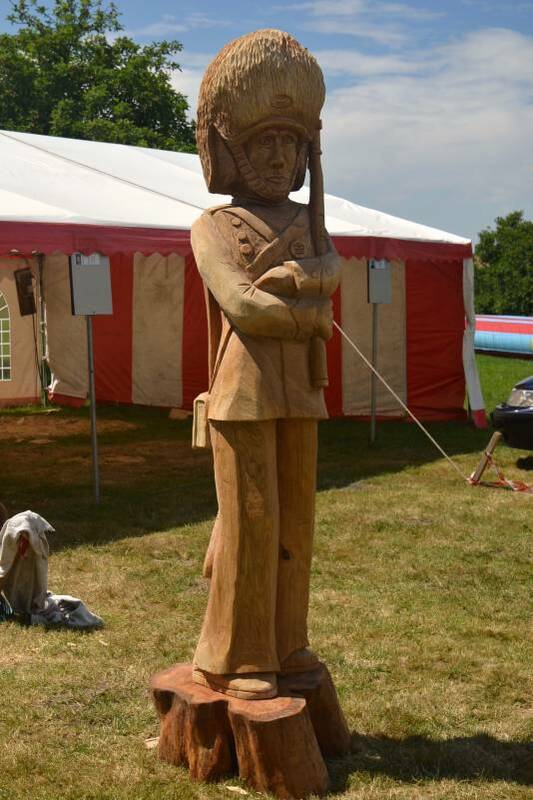 It was a really beautiful guardsman that we got delivered that summer in 2014, made by Julius Urbanavicius from Lithuania. The experience was completely fulfilled as he and his wife came to visit us. There was a small thing missing though, the Rex marks on the shoulders of the guardsman. This was fixed the year after by Julius. 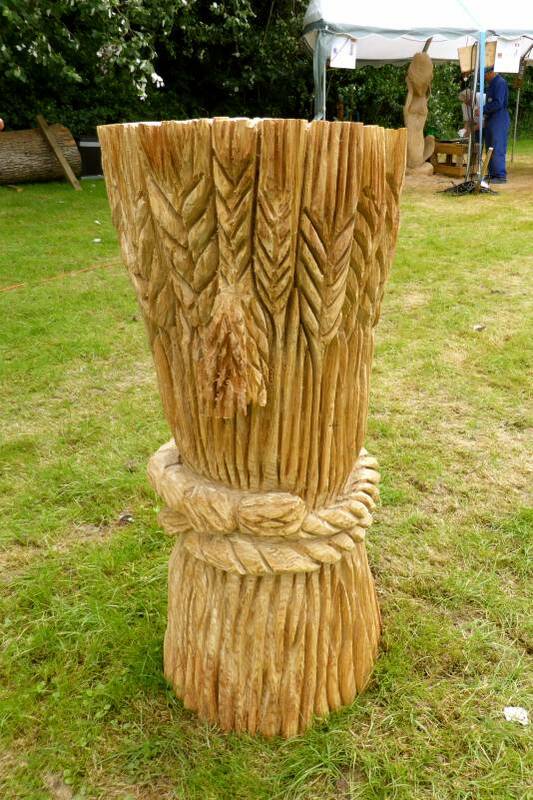 In 2016, I bought a sculpture shaped as the sheaf of corn, not the same size as the Guardsman, but in the height that a sheaf must be. The sculpture was made by Vitalija Urbonaviciene and was also really beautiful. My relation to the agriculture probably was the reason why I bought this sculpture. Overall, it has been a great experience, I have not only expanded my horizons in terms of art, but it has also been interesting to follow a small community that is passionate about a really good cause. Jørgen Schelde Pedersen from Lejrskov, Denmark, 2017. 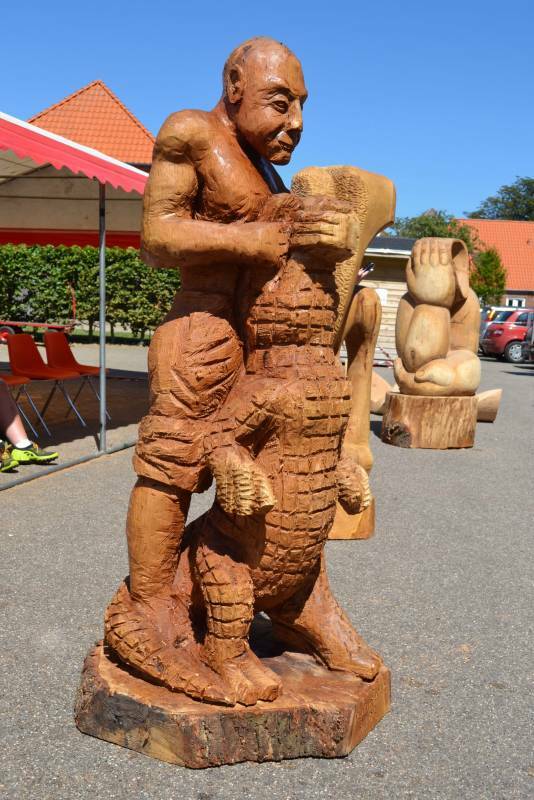 Through my years as a member of the association of Højer International Wood Sculpture Symposium, of which several years as a member of the Board, I have met many people from different countries such as Mutumba Ronald, who has participated in several symposiums. The first time Mutumba was in Højer, he invited me to Uganda, so that he could show me his country. He thought Uganda had a lot to offer and that I should see the country. At that time, Uganda was very exotic for me and I chose not to take his offer. 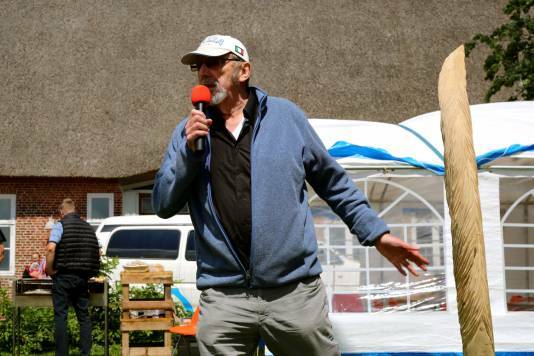 In July of 2014 Mutumba was in Højer, where he once again invited me, my girlfriend and a good friend to Uganda. We made a quick decision and took Mutumba up on his offer to visit him in Uganda. He went home and made an itinerary for the travel, which we received 14 days after his departure, with the request that we would prepay DKK. 15.000 via Western Union. We paid the money and flew to Uganda in August, 2014. During the trip we saw a lot of Mutumba’s work as an architect, his life and his family. Our experience of Uganda was that it is a beautiful country, with a population who certainly do not have much, but are overwhelmingly happy for what they do have. An experience like the one we had can not be bought for money, and we had this experience because we have a symposium in Højer. By Tommy S. Pedersen, Denmark, 2017. When you receive important news, something that you hoped for, it seems to be a gift from the universe, a moment of explosion of light, the body vibrates with happiness and you are bursting in a big smile. Upon receiving the news of being accepted into a sculpture symposium in Denmark, my feeling was to receive a helping hand in moments of despair, it was a voice of support. A long time of exciting wait - from the pleasant and surprising news, until the moment making the long journey over the Atlantic Ocean to sculpt a Danish oak trunk. Even if you deserve being selected into a symposium, it is a gift. In some way I now understand Albert Pedersen, chairman of the organization, whom I perhaps bored a bit with the number of times I said: thanks. This gave me hundreds of experiences. 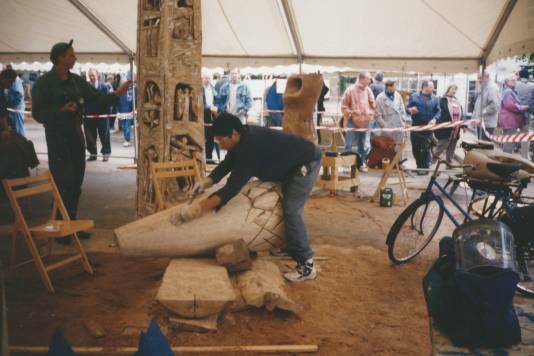 My first sculpture symposium, my first time in Europe. Something which I faced with little information. Nobody could guide me the way, from the airport in Hamburg, Germany, to the train station in a town cal- led Klanxbüll also in Germany, where I would be picked up. In fact, I took the risk and I ventured into the rail network of the city, and out of it. This brought something new as well, the first time I took a train. It was not as simple as it seemed. Today I still do not know how to do it the right way. I assumed an estimated time for the meeting in Klanxbüll, which I did not comply because I did not change the train on time. I was lucky to find people that helped me to continue my journey. In Klanxbüll I arrived with the last train, scared and with the phonenumber of a German girl, who dressed in red, was celebrating her Bachelorette party, completing some chal- lenges. She told me that I could call her if by chance nobody picked me up. Luckily just before calling her, I heard a few words in English - ”Do you have a Colombian here?” - (or, something like that, I think) - said Glebos Tkachenko, a Russian sculptor... For me, the sound of salvation. The rest, maybe others can tell it better than me. You can imagine how each day at the symposium was. Full of interesting talks and awesome experiences with the incredible artists and kind people of Højer. Daniel Alvarado León, Columbia, 2017. 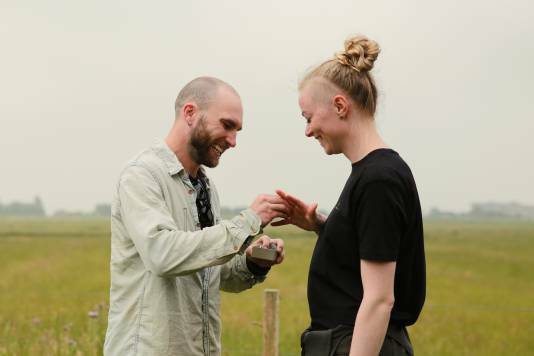 Højer Wood Sculpture Symposium celebrates its 25th anniversary this year and for this reason, the initiators behind the project are to be congratulated. 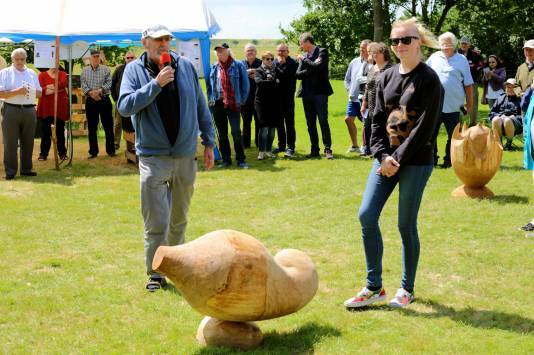 The annual International Wood Sculpture Symposium, run by volunteer enthusiasts from the local area, brings many artists to the city and to the area of the National Park Wadden Sea. Højer Design School has repeatedly served as a meeting and lunch place for the skilled wood sculptors. This has led to many exciting lectures, where the students gained a good insight into the skilled artist’s lives and works around the world. 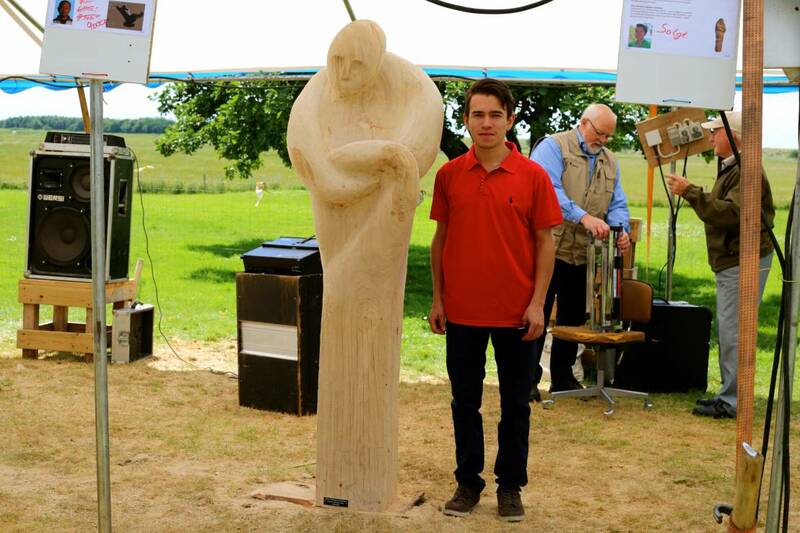 In collaboration between artist Julius Urbanavicius from Lithuania and Højer Design School, a nice sketch was made of a unique wood sculpture that Julius passionately worked on in 2015. 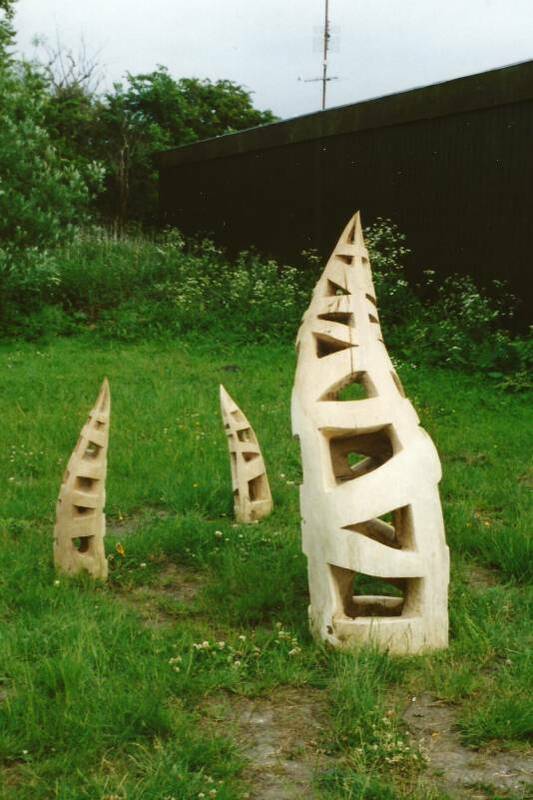 The unique wood sculpture was commissioned work for Højer Design School and is a great proof of what good crafts can produce. We thank you for the good cooperation and wish Højer Internationale Wood Sculpture Symposium good luck for the future symposiums. By Kirsten B. Hansen, Denmark, 2017. When we were visited by Ambassadors during one of the first symposiums, some of them were welcomed at Strandhotellet (hotel), where we served ”Herring with Old- emorssovs” (local dish with fish and sauce), which was a specialty at the hotel. We served the herring on ice cubes. After eating, one of our guests said: ”what a wonderful ice-fish.” He had eaten both the herring and all the ice cubes. Through the time I have experienced many emotional expressions from our visiting artists, an Argentinian cried loudly when he heard the melody ”Don’t cry for me Argentina.” A very big Israeli and a very quiet Rumanian cried, between many others, when during the church concert we heard ”Wind of change.” There were also always very big emotional outbursts when artists met, and especially when they parted. Over the years we have had some artists for whom it was the first time they attended a symposium. One time, I had to pick up a Bulgarian girl in Tinglev, and all the way to Højer she answered only with short words when I spoke to her, just as she was very quiet during the symposium. When she was selected for the symposium again a few years later, I had to pick her up and was prepared for a quiet girl. But in the meantime, she had been attending several symposiums and was absolutely no longer a quiet girl. One of the most amazing things is the artist’s communication across language and culture. We have repeatedly experienced artists communicating without a common language and have seen how political and cultural differences were put away. There has always been a good social harmony between the artists. Countless times, an ordinary evening ended with mutual entertainment, with everything from storytelling to solo songs. Many artists are also entertainers, a good example is Julius Urbanavicius, who has, among other things, been entertaining on air guitar 2 times. We have made posters.